Note: Chef Curtis Cooke gave us this recipe and it is also on the Golden Door facebook page! Thanks guys yum! In a 1 quart sauce pot, combine all of the ingredients. Place the sauce pot over medium-high heat and cook for approximately 5 minutes. bowl, whisk together the cottage cheese, agave nectar, eggs, buttermilk and melted butter. Fold in the flour mixture. Spray a 10 inch non-stick pan with the cooking spray and heat it over medium heat. Spoon a heaping tablespoon of the batter in to the pan for each pancake. 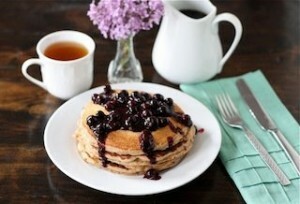 Cook for about 2 minutes, or until golden brown, then turn the pancake over and continue to cook for 1-2 minutes. 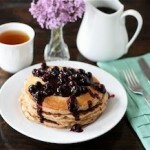 To serve, stack 3 pancakes and spoon 2 tablespoons of blueberries over the stack.